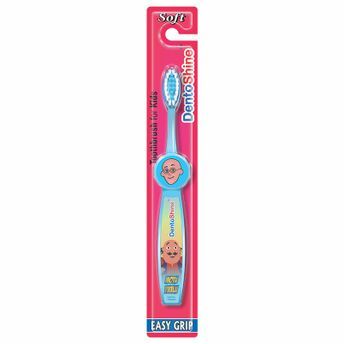 Let's make brushing time fun with DentoShine Motu Patlu Easy Grip Toothbrush for Kids. It has a big handle that gives a firm grip, soft bristles and edges that are gentle on your kid's teeth and gums. Available in four attractive colours, your kid will love using it morning and night. About the Brand: With a vision to encourage kids to improve oral health and get healthy smile lifelong, Novateor Group of companies has introduced DentoShine Gel toothpaste for Kids with three exciting flavors, in association with Chhota Bheem and team characters. This helps to make it a fun experience for kids, while brushing their teeth and fighting against cavities, dental germs and bad breath. Explore the entire range of Teeth & Dental Care available on Nykaa. Shop more DentoShine products here.You can browse through the complete world of DentoShine Teeth & Dental Care .